Kitchens Are Monkey Business: Rosie Likes Purple Food. Roasted, peeled, and grated beets on the left. 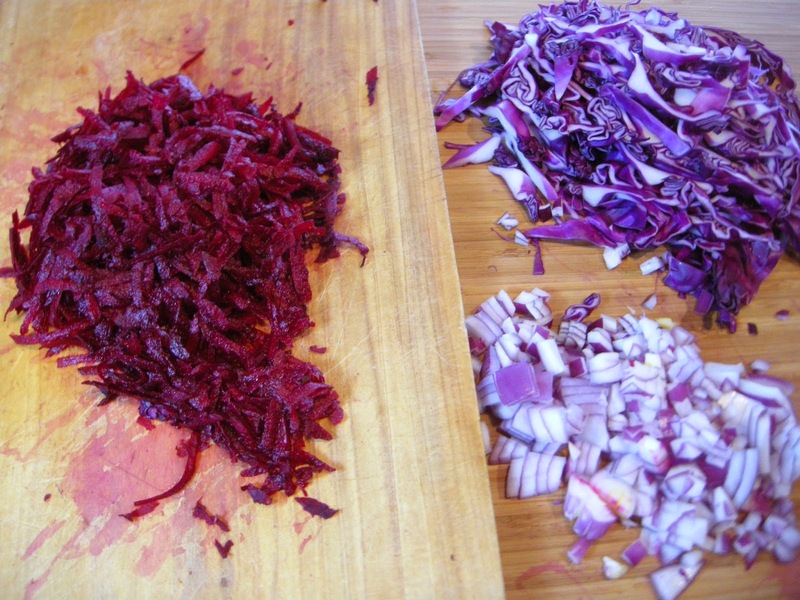 Shredded cabbage and chopped onion on the right. Prick the bratwurst all over and place in large skillet, medium heat, with the oil. Add beer halfway up side of brats and bring to a simmer. Cook, turning once, about 20 minutes. Increase heat to medium high and cook until liquid evaporates. Add more beer and continue cooking until it evaporates. Continue adding beer and evaporating until you have about 12 ounces of beer left. Roll brats to the edge of skillet and add onion in center. Cook, turning bratwurst often and stirring onion occasionally until sausages are browned and onion soft, 6-7 minutes. Transfer brats to a plate and add beets and cabbage to skillet. Season with salt and pepper. Cook, stirring, until cabbage wilts, about 5 minutes. Add vinegar, brown sugar, allspice, and remaining beer. Cover and cook about 10 minutes. Add sausages to skillet, cover, and cook another 15-20 minutes. at the bottom of the pan. These roasted bits are referred to as "fond"
and it's all concentrated flavor. and stir in cabbage and beet. Apple cider, brown sugar, and allspice in. Last of the beer in. Return brats to pan, cover and cook about 15 - 20 minutes.